Sweet and Sour | "In good writing, WORDS BECOME ONE with things." Weekends away are supposed to be rejuvenating and fun, not make you want to get your tubes tied. 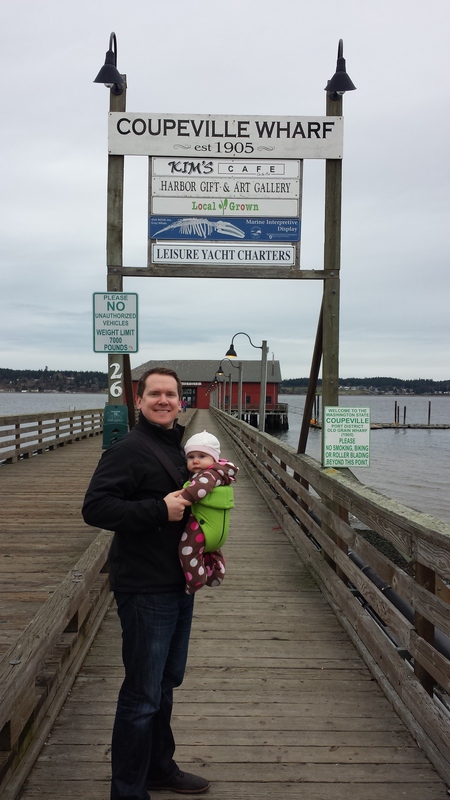 Over Valentine’s Day weekend we had our first family getaway to Whidbey Island for my 30th birthday. We rented a house on the beach, Mike took two days off of work, and we hopped aboard a ferry for the short trip across the sound to the island. I finished all of that, feeling like an Olympian, and pronounced, “We’re ready to go!” And then immediately realized I hadn’t actually packed myself. Cue another 30 minute delay of departure. When we arrived we soaked in the fresh feeling of being somewhere new and unfamiliar. The view of the water and mountains was gorgeous from every window and we felt our lungs expand from the vast amount of visual space. I’m big on visual space. I get a little suffocated when my eyes have nothing to gaze upon but the four walls around me. Beach houses are the perfect remedy. 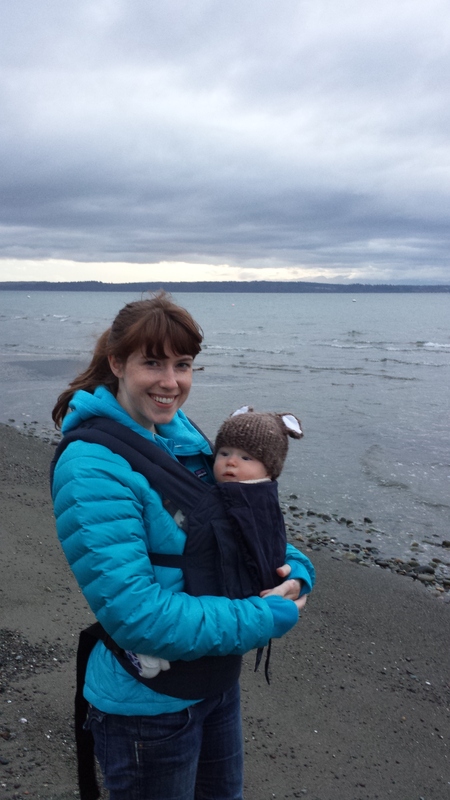 We strapped the babies onto our chests for a walk on the beach. It was perfect — sunny, brisk, and nobody else in sight. 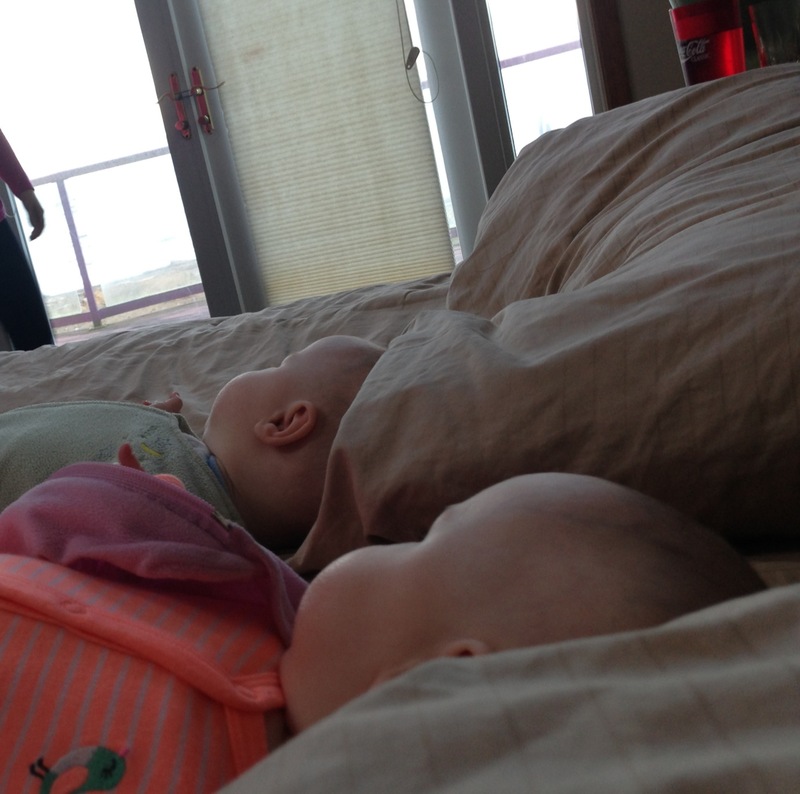 The babies cuddled against us and we beamed at each other, proud that our trip was proving to be family-of-four fun. We had brought along several bags of food, knowing that going out to dinner wouldn’t be an option with two six-month-olds. But I told Mike I was getting a little panicky at our lack of adequate post-dinner sweets, plus we didn’t even have popcorn, which in our family is an aberration. In true Mike fashion, he agreed to buy a handful of snacks and instead returned with three bottles of wine, chips and salsa, popcorn, half a dozen types of candy, ice cream, potato chips and beer. I almost had a stroke, but then reminded myself that this is a significant portion of our fun these days; the theory being, we can’t leave the house at night, so let’s pig out and watch movies like fatties. At this point, we were still buoyantly optimistic about our getaway. We knew traveling with children could be a double-edged sword, we just didn’t realize quite how sharp. For the remainder of this post, I’m going to slice and dice. The first night was the night of my 30th birthday, so we had a fabulous home-style happy hour on the deck while the kids napped. Mike gave me a few presents, and then he made dinner. The kids went to bed without issue and slept well all night. Nothing! It was an early win. The next day we explored Langley, an adorable seaside town with lots of shops, cafes and art studios. We walked the babies around happily in their strollers and then decided to have lunch at a popular pizzeria. Just as the waitress approached while we were waiting for a table, the babies were like, “Oh you wanted to have lunch? Perfect timing, because we want to get out of here.” We sighed and left, knowing we were no match for babies who want to nap but can’t fall asleep. Hunger caused our good-naturedness to hit a snag. We got in the car to head home for lunch but realized we were too hungry to make a meal from scratch. Mike stopped at the corner market while I ran inside for a frozen pizza, which, after smelling gourmet pizza moments ago, was torture. By the time I was back in the car the babies had fallen asleep, so we decided to return to the restaurant to salvage our afternoon. We got a table with a gorgeous view and quickly ordered a pizza and two beers. “How long do you think we have?” I asked Mike. “Twenty minutes? How do we get the food out here faster without looking like jerks?” he said. “She just saw us leave earlier because of them, so let’s hope she can figure it out,” I replied. The babies woke up not long after the pizza arrived, but I already had their bottles ready so we each fed one while feeding ourselves. It was a stroke of genius to choose pizza because it can be eaten with one hand. We took another great walk on the beach when we got back to the house and put the kids down to sleep without issue. They woke up once or twice overnight but it wasn’t earth-shattering. 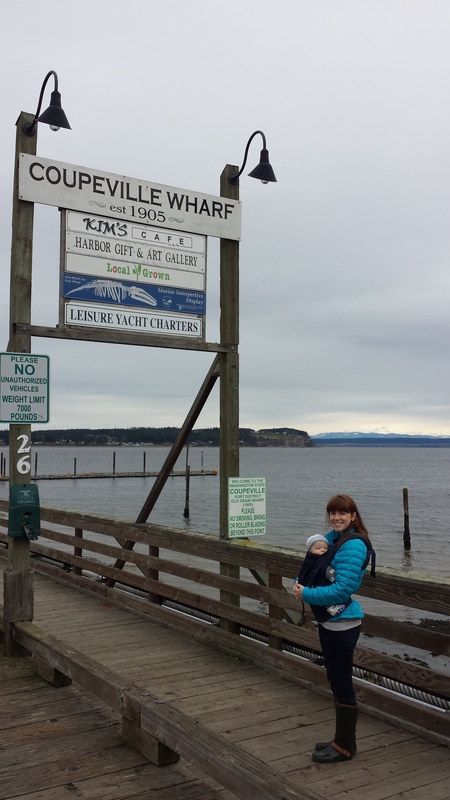 On Saturday we drove to Coupeville, the other charming town on Whidbey, and explored shops and drank coffee and wore the babies on our chests. We had a great time, and our positive pizza experience gave us the confidence to try for lunch a second time. This time we chose what appeared to be the most popular bakery/restaurant in town, Knead and Feed, which had a dining room the size of our living room at home. We sat at a two-person table, which was bold considering we were each wearing an extra person. The people were so disarmingly welcoming we actually began to relax, rather than spend the entire hour stressing over everyone’s disapproving stares. 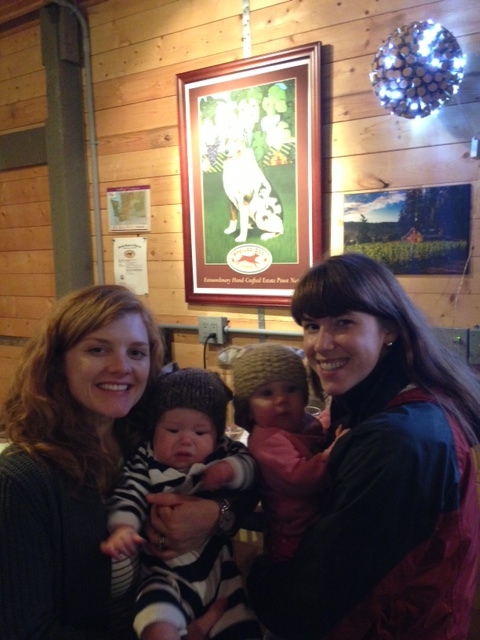 Several people came by to interact with the babies and we were so happy it was a little ridiculous. We ordered big meals, Mike even going so far as to order mussels, which later proved to be as impossible as it sounds while holding a baby. As we were finishing our meals, the babies were tapping their watches and motioning toward the door. We scrambled to stuff the last few bites in our mouths while cooing at them and sing-songing our way through waiting for the bill. We stood up to put our coats back on, as well as our baby carriers, and the entire room turned to watch. 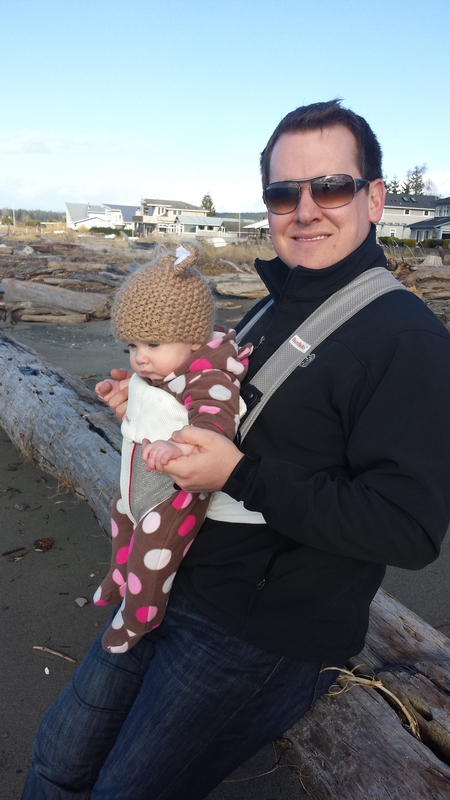 Putting a baby in a Baby Bjorn is difficult enough with two people. Putting a baby in one with only a baby-holding person to help is like juggling bowling balls with one hand. We wrestled everything into position and then burst out laughing when we couldn’t get one strap buttoned into another. Everyone was staring, we were sweating from the effort, and we tumbled out the door of that pressure cooker. Sarah and Casey met us back at the house to spend half a day with us, and we were thrilled to have great company as well as extra hands to hold babies. We ventured out to a winery nearby for some wine tasting, and then had dinner together back at the house after the babies went to sleep. Except that they didn’t, not really. Arden cried for half an hour before falling asleep, and then woke up around 10:30PM, never to return to real sleep ever, ever again. The Bullers left around 9PM, so thankfully they were spared the screaming. We’re not sure what changed between the other nights and this night, but we assume it was just her weariness at not being in her own bed, because she’s never cried that much in her entire life. We took turns walking her around, pacing the room and silently begging her to go to sleep. We soothed, we sang, we kissed, we participated in a parenting ritual as old as parenting itself. Henry slept through it, miraculously, so at least a quarter of us was getting some rest. We kept moaning to each other, incredulous that we dared to think this would be relaxing. She would quiet temporarily, and then the second we’d put her in her crib she’d scream like her life depended on it. A few rounds of that game of battleship and she sunk us, so we brought her into our bed. She fell asleep after awhile and we collapsed on our pillows in relief. I started to relax and then noticed something. There were two skylights directly above our bed. On our first two nights these were appealing — we had great lighting during the day and could see the moon as clear as day during the night. As I looked up on this night, however, I saw the moon approaching the skylight directly over Arden’s little body. I whisper-yelled to Mike, “The moon! The light is going to wake her up! What do we do! ?” I put my hand between her face and the light. His bleary eyes looked back at me like, really? Now we’re battling space to get our kid to sleep? The spotlight shot down on us like a cannon, illuminating the entire bed. She startled awake and the long charade began again, this time with Henry chiming in. He wasn’t crying from restlessness so much as a general complaint to management. I couldn’t blame him; these living conditions were entirely unacceptable. Mike carried Henry around the room, and I counted up the hours left until morning, which only brought me right to the brink of losing my mind. So this, I thought, is why people refuse to have more than two. It’s making perfect sense to me now. “I’m way ahead of you,” was all I could mutter in reply. We nestled the two crying babies between us in the bed and cuddled them as best one can cuddle a screaming infant. We looked at each other and sighed as they finally fell asleep. The next morning, if you can call a morning “next” when you have all but ushered it in, we groaned as the light filled the room and the babies started their day. I fed each of them and we said a holier-than-thou “We forgive you” as they stared at us with their eyes full of love. And that’s what always gets us — no matter what happens overnight, no matter how enraged and beleaguered we feel, those cherub cheeks and happy squawks pierce through the misery and we’re hopelessly in love again. Yes, thank you! It is SO stressful. I have no idea how you managed a plane ride. That is a bridge we have yet to cross.